Nirvana Bleu Owner, Sandra Stola with a client. Nirvana Bleu Gommage Créme exfoliant in use. Nirvana Bleu Gommage Créme and Tres Buerre Créme. Nirvana Bleu Gommage Créme 2.5 inch round lid label. Nirvana Bleu Tres Buerre Créme 2 inch round lid label. 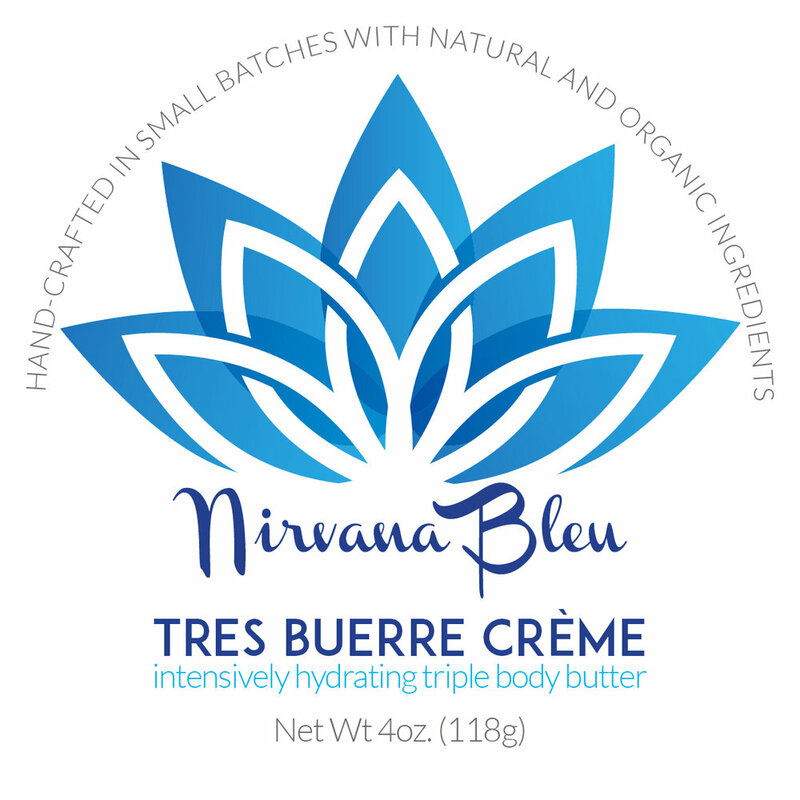 Nirvana Bleu Tres Buerre Créme 8.5x1 inch side label. 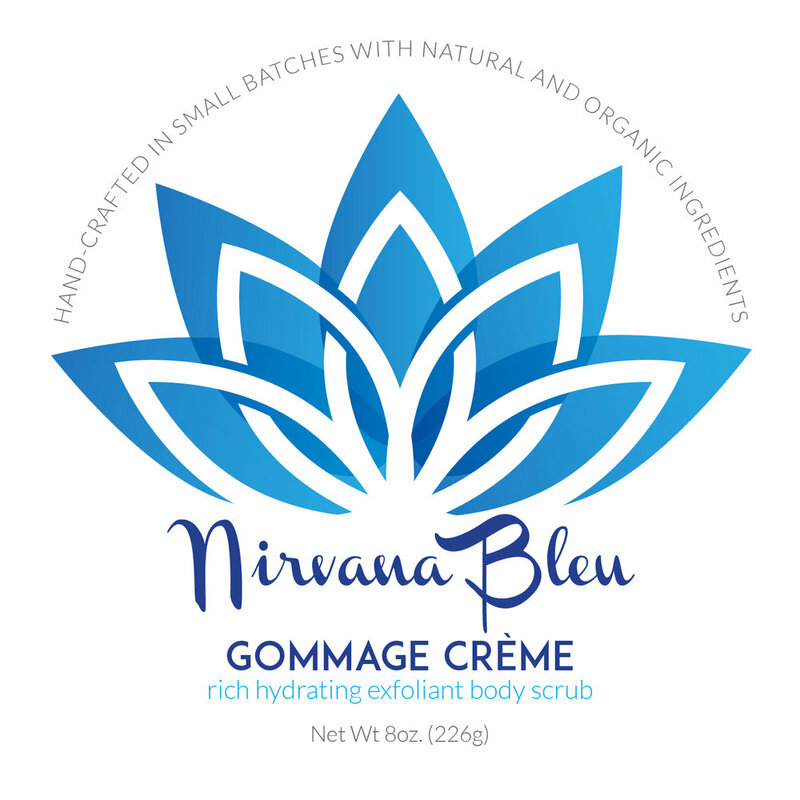 Nirvana Bleu Gommage Créme 11x1 inch side label. The labels needed to be easily applied and water resistant for in shower use. They also needed to be easily read, with all relevant ingredient and legal information. When Granny McCarthy's Tea Room opened in 1997, the owner and chef toured Ireland to sample and collect recipes for making the traditional wheaten bread that is a staple of Irish cuisine. The recipe that was adapted for the restaurant used Pennsylvania locally sourced organic grains, and is still served with many of the dishes in the newly established McCarthy's Red Stag Pub and Whiskey Bar. The brown bread is so popular, that the owner decided to start packaging the mix and offer it for sale to his restaurant and retail patrons. 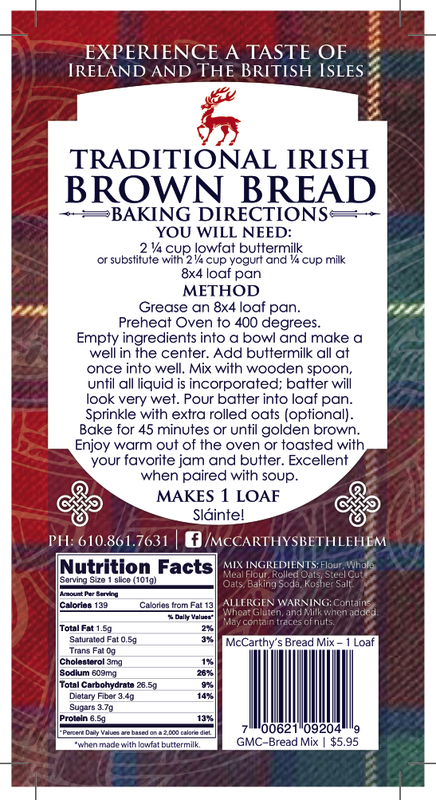 The parameters for the label were that it needed to fit onto the brown kraft bags the McCarthy's Bakery used to package the mix, they needed to be low cost to produce, and the owner decided to use the original McCarthy's logo to distinguish products being sold. I wanted to use the McCarthy's Tartan (which I love) as the background, as I thought it worked well against the color and texture of the kraft bag. BRIEF: Create a visually appealing label that would work on kraft bags. 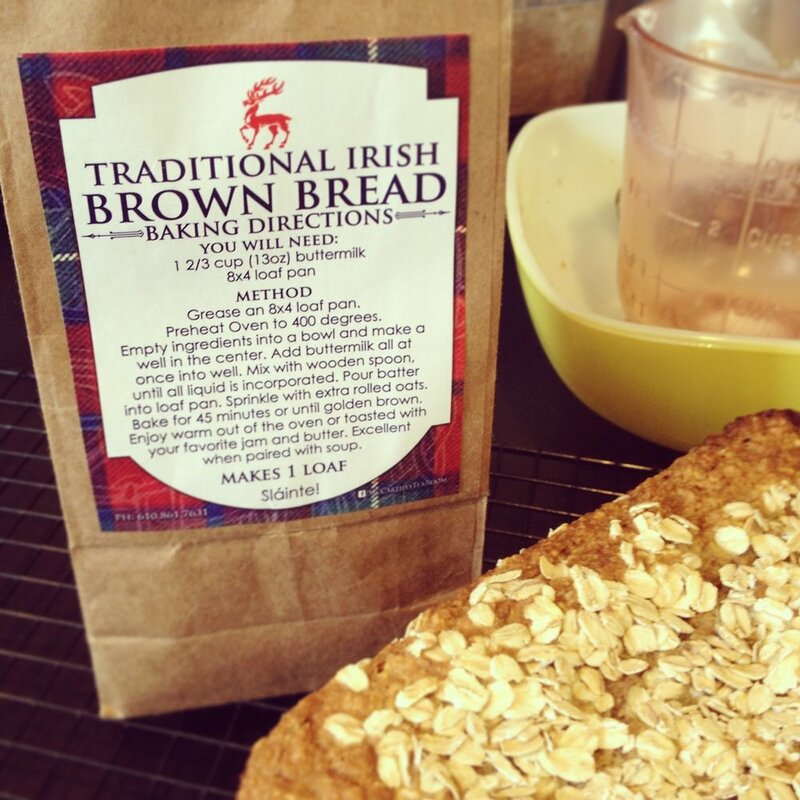 Needed to be easily reprinted at a low cost, as the brown bread mix is packaged in-house. Use the original McCarthy's logo mark, and incorporate the McCarthy's Tartan. McCarthy's Loose Leaf Tea Labels are used by staff to mark the type and ounce quantity of the over 20 varieties of loose tea offered and sold by the restaurant. Designed to match the package labels created for the Traditional Irish Brown Bread mix sold by the restaurant and retail shop, the labels needed to fit on the smaller light proof bags used to fill loose tea orders, and have a writable surface for the staff member to fill in the type of tea and amount in the bag, as each tea has a different per ounce cost. 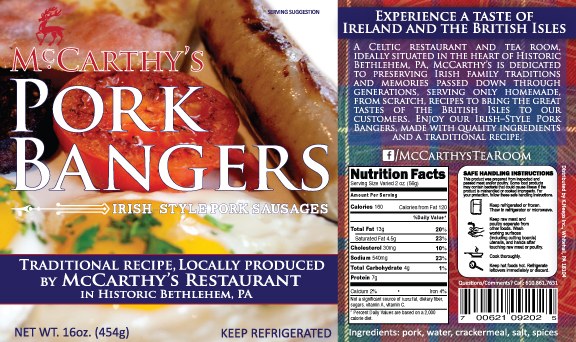 Originally, I had created the McCarthy's Tartan Pig to designate the pork products that are locally produced using the traditional Irish recipe provided by McCarthy's and which are sold in the restaurant and retail shop. Aiming for an artisan feel to distinguish the high quality products from the competition, I had kept the background white and the lettering bold and clear, using the same colors found in the McCarthy's Tartan. Adding the whimsical pig to inform the buyer exactly what kind of meat they were purchasing. Conceptual and produced promotional pieces to complement McCarthy's Red Stag Pub's evolving branding. Used on a daily basis for customers to take home freshly baked goods, take away dinners and doggie bags. A wish, that sadly, was discarded due to budget constraints. Used in McCarthy's Red Stag Pub at the bar. Used during Musikfest and Celtic Classic for take away draught beers.